Home » Media » Is Ken Rosato Married? Partner & Gay Talks - Detailed Bio! American journalist Ken Rosato- famously known as the smiling journalist- had always kept himself away from the spotlight when it came to marriage. But Could he already have been married in a secret wedding? Is he hiding everything behind the cameras? The New York-native rose to prominence after winning the Emmy Awards for his brilliant reports on the Steaming Pipe Explosion piece in New York on 19 June 2007. He currently anchors at WABC morning newscasts. Rosato, who also has experience working as a radio host, is active on Twitter and has more than 29k followers as of October 2018. Ken Rosato, born in New Rochelle, New York, on 4 May 1967, grew up in a middle-class American family. He belongs to white ethnicity. He studied at Regis High School in New York City for his early academics. For his Bachelor's he moved to New York City University in 1998 where he received the degrees in Film, TV, and Radio. After the completion of his undergraduate studies, he received a master's degree in Spanish and Italian. A charming personality with a never-ending smile pasted on his face, Rosato stands tall at the height of 6 feet (1.82m), adding to his persona. What Is Ken Rosato's Salary? Often known for masking about his personal life, the exact figure of Ken's net worth remains desolate. The multi-talented anchor's net worth might be in millions of dollars and it would not be a stretch to say that he is one of the high earning personnel in this field. In 2018, Rosato earns over $63,000 as his monthly salary. 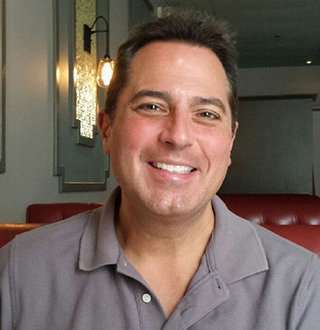 Having been very public about his stance on the matter of Gays, it is quite clear that Ken Rosato is of benevolent nature and advocates Gay community. Ken has been supporting the gay community and voicing about them for a very long time. On 25 June 2017, He voiced for the gay (LGBT) community hosting The Pride march, which went live for the first time in the history of Television. Is Ken Rosato Married To His Work Partner? Ken Rosato has kept his personal life private and out of the spotlight. He usually doesn’t talk about his private life in public and has largely remained mum about his partner. However, the journalist often posts about his co-worker Lori Stokes. He even shared a picture with Lori once with a caption stating that she was his work wife. Well, the caption, clearly hinted that the duo's togetherness was the result of their profession and nothing else. But gifting a flower in valentine's and being spotted hanging out with Lori who is also single adds to the fact that they might be dating each other and anyone can sum up that. Still, Ken openly claims that he is not romantically linked to anyone and strong proof to his words is his history of having no girlfriends. And well, it seems like Ken's secretive nature will make us wait a long before he himself reveals the details of his love life.